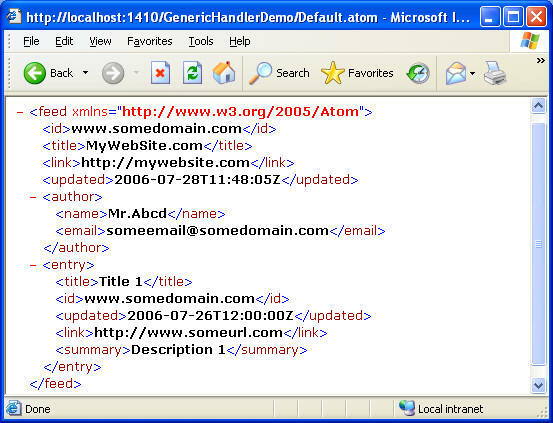 ASP.NET has its own set of file extensions such as .aspx, .ascx and .asmx. What if you want to create resources that have custom extensions? Http handlers allow you do just that. In this article we will create two custom extensions - .rss and .atom - that will be handled by two HTTP handlers. To simplify the configuration we will further create HTTP handler factory that decides which handler to invoke. HTTP handlers are nothing but classes intended for processing a custom file extension. They are similar to ISAPI extentions. Internally they implement IHttpHandler interface. HTTP handlers are useful when the resource you are creating is highly customized and web forms can not present a neat solution. For example, let's say you want to expose RSS and ATOM feeds of your web log to the external world. Sure you can do that using normal web forms. However, since you are not rendering any user interface as such why incur overhead of page level events? Your task can be best accomplished by a custom handler that will emit RSS or ATOM feeds directly onto the raw response stream. This way you can avoid the overhead mentioned above as well as you will be able to design a more readable and meaningful extension for your resources (say .rss for RSS feeds and .atom for ATOM feeds). What is HTTP Handler Factory? HTTP handler factory is nothing but a class that implements IHttpHandlerFactory interface. Handler factories come handy when there are many HTTP handlers and you do not know the exact HTTP handler to use untill runtime. Handler factories also reduce your configuration management (in IIS as well as Web.config) because all you need to configure is the factory assembly and not the individual handlers. The IHttpHandler interface is implemented by all the handlers. The interface consists of one property called IsReusable. The IsReusable property gets a value indicating whether another request can use the IHttpHandler instance. The method ProcessRequest() allows you to process the current request. This is the core place where all your code goes. This method receives a parameter of type HttpContext using which you can access the intrinsic objects such as Request and Response. The IHttpHandlerFactory interface consists of two methods - GetHandler and ReleaseHandler. The GetHandler() method instantiates the required HTTP handler based on some condition and returns it back to ASP.NET. The ReleaseHandler() method allows the factory to reuse an existing handler. Add a new project of type class library called FeedHandlerLib. Add a class called RSSFeedGenerator. Add the following code to the class. We will not discuss the RSS format in details here. 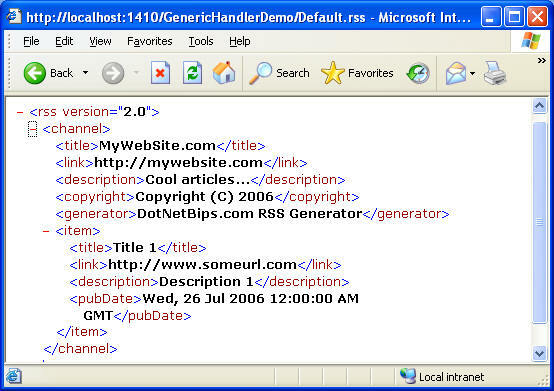 You can read Creating RSS feeds for your web site and Consuming RSS feeds on your web site for more details on RSS file format. The RSSFeedGenerator class has a static method called GetRSS(). The GetRSS() method selects all the articles from the database and generates an RSS feed out of it. It first serializes all the data in a MemoryStream instance with the help of XmlTextWriter class. Then this data is converted into a string and returned back to the caller. The following figure shows a sample of the RSS feed generated by this class. The class implements IHttpHandler interface. The IsReusable returns false indicating that we don't want to reuse the instance of the handler. The ProcessRequest sets the ContentType of the response stream to text/xml. It then calls GetRSS() method of RSSFeedGenerator class. The returned string (which is nothing but RSS feed) is written to the response stream. 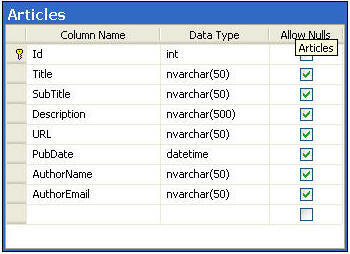 Note that use of HttpContext parameter in accessing the intrinsic objects. This code is very similar to the one that we wrote previously. However, it generates ATOM feed instead of RSS. The following figure shows a sample ATOM feed generated from this class. As before the ATOMHandler class implements the IHttpHandler interface. This time the ProcessRequest() method calls GetATOM() method of the ATOMFeedGenerator class and writes it on the response stream. Here, we created a class called HandlerFactory that implements IHttpHandlerFactory interface. In the GetHandler() method we check the extension of the incoming request. If it is .rss then we return a new instance of RSSHandler class. On the other hand if the extension is .atom then we return a new instance of ATOMHandler class. The <httpHandlers> tag is used to configure one or more custom HTTP handlers. The path attribute is used to specify one or more the extensions (.rss and .atom in our case) and the type attribute is used to specify the fully qualified name of the class that is intended to handle them. Note that though RSSHandler and ATOMHandler are the actual handlers of the .rss and .atom extensions we have specified the factory class name. The factory will take care to instantiate the correct handler at run time depending on the extension of the request. In the Executable textbox select aspnet_isapi.dll (you should find it in the installation folder of .NET framework). 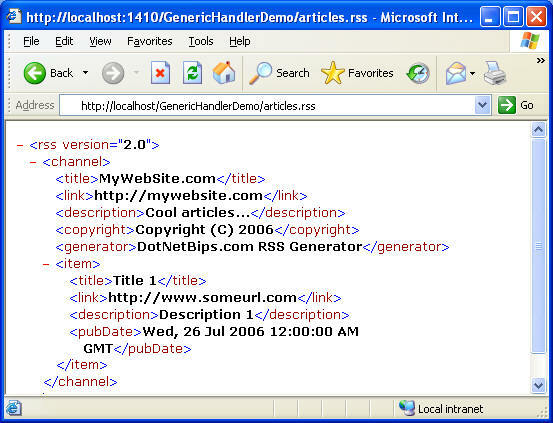 In the extension textbox enter .rss. In the Verbs section specify the verb as GET. 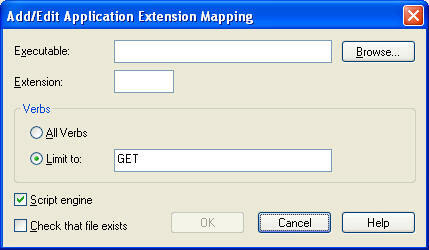 Finally, uncheck the "Check the file exists" checkbox and close the dialog. Repeat the same procedure for .atom extension. Now IIS knows what to do if someone requests .rss and .atom extensions. IIS will simply forward these requests to ASP.NET which then forwards them to the handler factory (because we configured it in the web.config file). That's it! You are ready to test our handlers now. Simply run your default web page, key in articles.rss in the address bar and hit enter. You should get the RSS feed in the browser window. HTTP handlers are flexible way to handle your custom extensions. The handler factories are intended to instantiate handlers depending on some condition. They help in reducing the overall configuration required for your web site. Using HTTP handlers can save us from unnecessary page level event processing thus improving performance.